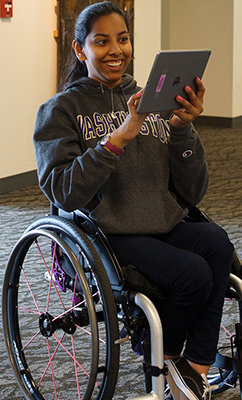 OurCS@UW+AccessComputing is a two-day research-focused workshop for undergraduate women with disabilities. The workshop will be held in April 11-13, 2019 at the University of Washington campus in Seattle. Female students and mentors with disabilities are being recruited nationwide. Students will participate in group research projects designed to inspire participants to consider research careers and learn about faculty and graduate student mentors' current research. Transportation, housing, and meals will be provided for participants. Funding is provided by Google Explore CSR, the Paul G. Allen School of Computer Science & Engineering, and AccessComputing. For priority consideration, applications should be submitted by Dec 15. Applications received after the deadline will be considered as space allows. Questions can be directed to accesscomp@uw.edu.